A horrible nightmare marks the beginning of an epic journey. The journey of a lifetime begins! A great tree, a surreal and disturbing dream, and an eternal forest—these are the beginnings of an adventure beyond imagination. In this tale a young hero named Link must journey from the woodland home he has known all his life into the great world in order to save all he knows from destruction. Does he have the power to change an uncertain future? Does he have the wisdom to know what to do? Does he have the courage to endure? Perhaps the most important question of all—will he be able to survive the evil that awaits? In Master Quest be prepared for two things: the map has been mirrored so what's left is now right and vice versa, and you'll be forced to use potions and shields due that the fact that no enemy will drop hearts when defeated. 1 Welcome to the Kokiri Forest! 4 To the Great Deku Tree! Welcome to the Kokiri Forest! Link's home, the Kokiri Forest. 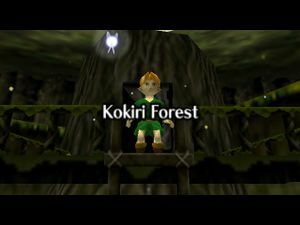 The adventure begins with a narration by the Great Deku Tree, the guardian of the forest and the father of its human inhabitants, the Kokiri. Link, our young hero, is the only boy in the Kokiri village without a fairy. Suddenly, he is awakened from a particularly disturbing nightmare to find a fairy in his room. The fairy, exasperated, beckons Link to come with it to the Great Deku Tree in order to hear some urgent news. 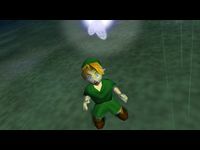 The young boy bursts through the doors of his home only to be greeted by Saria, his childhood friend. She is overjoyed that Link has finally gotten a fairy of his own, but Link knows deep inside that this was not to be the happy day his friends would expect it to be. The jealous Mido will do his best to make sure of that too. 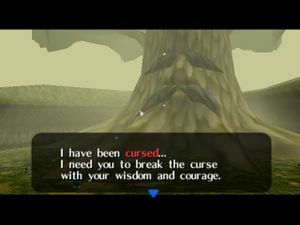 Shocked inexplicably by the apparent favor that both Saria and the Great Deku Tree have shown to Link, he will do everything in his power to prevent you from seeing the great tree. He insists that you must have both a sword and a shield before you can pass. What a jealous fellow, indeed! Clearly, this portion of the game was designed in order for you to become accustomed to the controls and game functions. Fortunately, this is unlike almost any other in-game tutorial out there: it's fun. Already, you have been presented with a problem—that Mido is blocking your way—and now you must set out to find a solution. You will need to find the Kokiri Sword and Deku Shield . While you can get the items in any order, getting the sword first may help you acquire the 40 rupees necessary to purchase the shield. The sword isn't very difficult to find. To reach it you must first locate a hole in a wall the "Forest Training Center," a fenced area up on a hill. Using your mini-map, head to the western side of Kokiri Village. The hill is on your left. Make your way through the fences, approach the crawlspace at the end, and press the button when prompted to crawl through it. Be careful—on the other side. You'll have to dodge a huge rolling boulder. You can do this by ducking into alcoves when it is rolling toward you. Once the large rock has passed, simply run behind it. If you explore this section, you may find two blue rupees beside the tall, skinny weeds. Collect them, as they will be helpful for purchasing the Deku Shield . You'll easily locate the chest by zigzagging to the left then to the right from where you entered. Open it to get the Kokiri Sword! You're now half-way toward getting past Mido. 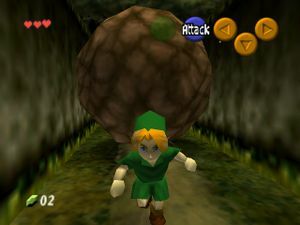 Wait for the boulder to pass again before you head back to the crawlspace and the Kokiri village. In the Forest Training Center (where you crossed through to reach the crawlspace), you will notice a house to the right of the fences. 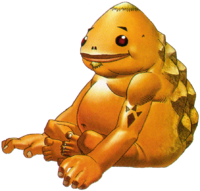 You can ask the people in the house to tell you about the game's controls, weapons, and other lore. Within the fences you will find a boy staring at a rock. Talk with him for an introduction on how to use your sword and the game's targeting system using the button. Read the various signs to learn new tricks, or talk to the other Kokiri. Make sure to spend a little time here getting used to the mechanics because you'll certainly need to be well versed in them ahead. You might find some rupees when you backflip targeting the rocks or thrusting the signs or jumping from fences. …and talk to distant people. The Deku Shield can be purchased at the shop for 40 rupees , the staple currency of the Zelda universe. Of course, you start the game off with no money at all, so you'll have to do a little exploring in order to track down the cash! Some free-standing rupees are sitting around town, so be sure to look behind buildings and use the first person view to help find them. Cutting bushes and running through the tall grasses is also advised. Try to walk to the end of the bridge. Or jump straight on the blocks in the water. Mido's house has chests with rupees. Once you have 40 rupees, head to the shop and get your shield. You won't need to buy anything else, as you'll soon encounter the other items. After you've purchased the shield, don't forget to equip it! Then it's time to show Mido your new Deku Shield! For more details on what you can do right now in the Lost Woods, see More Deku Sticks. You have the option to open up more of the map. There is not much you can do here presently, but you may wish to get familiar with the area now before you have to come back later in your quest. To the Great Deku Tree! Show your stuff to Mido, and he will pout—he didn't anticipate that you could actually complete such a task. However, he has to keep his word, and he now allows you access to the Great Deku Tree. Poor Mido doesn't feel loved. This page was last edited on 29 December 2018, at 06:50. This page has been accessed 674,195 times.